We have moved. Follow us at our new website, Land Transport Guru! Serangoon Bus Interchange is a small air-conditioned bus interchange located at Serangoon Central and built within the shopping mall nex. It connects to Serangoon MRT Station and the nearby Braddel Heights CC, Serangoon NPC and various schools. 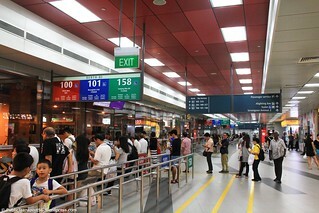 It is also the second air-conditioned bus interchange to open along the North-East Line. 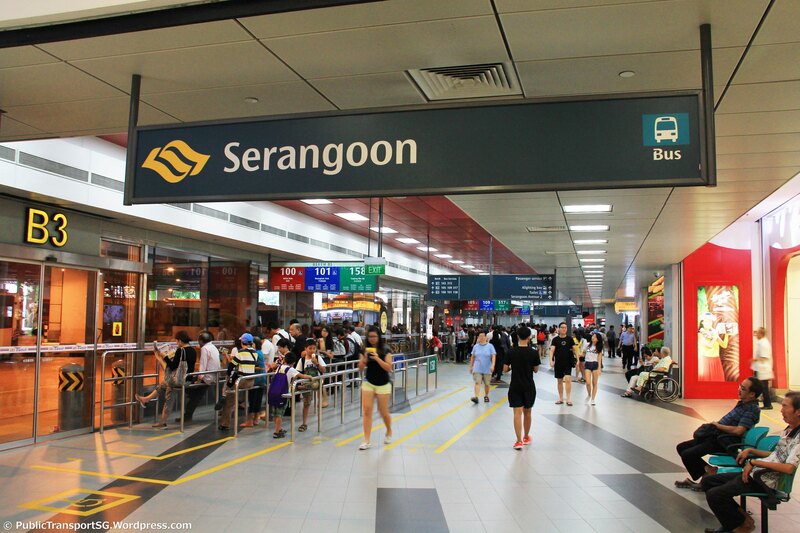 The need for a bus interchange at Serangoon arose in the mid-1980s with the development of Serangoon New Town. On 10th March 1988, Serangoon Bus Interchange opened along Serangoon Central, built underneath a multi-storey carpark (Block 264). This interchange took over the overcrowded Serangoon Gardens Bus Interchange and a temporary bus terminal along Serangoon Avenue 3. The spacious compound had both end-on berths at the East side and sawtooth berths (with a bus park) at the West side. 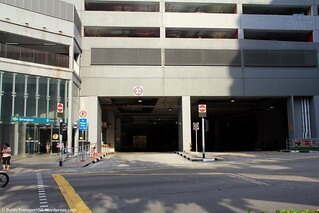 Entrance and exit was located along Serangoon Ctrl. 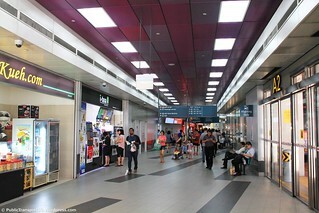 When the nex shopping mall opened in November 2010, the old bus interchange continued to operate until 3 September 2011 when it was relocated to the new interchange. The air-conditioned interchange is located on the bottom floor of the mall and provides easy connection to Serangoon MRT. It also incorporates glass walls facing the bus bays to allow passengers to easily see when the bus is arriving. Serangoon has a history of four feeder services: Service 312, 315, 317 and 318. Service 312, which served Serangoon Avenue 3 and Upper Serangoon Rad, was withdrawn in 1992. Service 318 was merged with Service 315 in 1989 and withdrawn. Services 315 and 317 continue to operate today. The shift to the new Serangoon Interchange brought about many changes in bus routes. 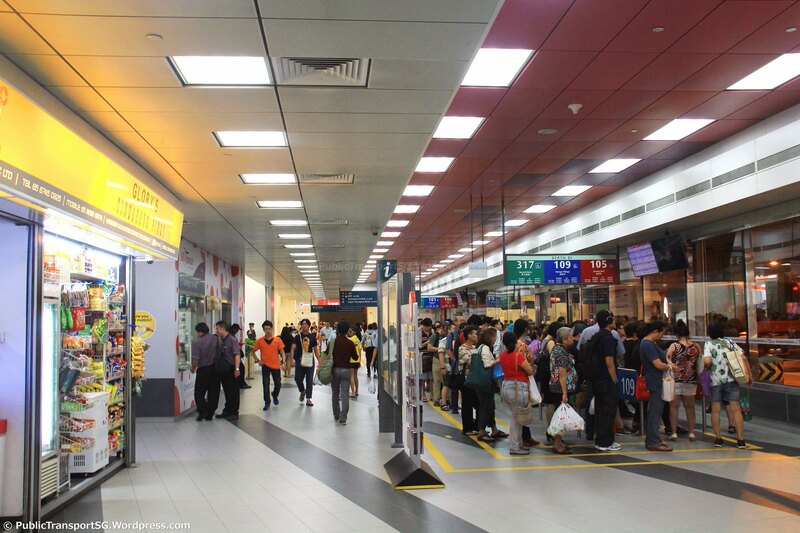 Services 100, 101, 103, 105, 109, 158, 315 and 317 were relocated to the new bus interchange, while two existing services, 81 and 82, were amended to loop at Serangoon Central from Tampines and Punggol Interchange respectively, as the small bus interchange could not handle too many buses.